When I mentioned the forthcoming Blu-ray release of Mad Max a couple of weeks ago, the view was expressed in comments that the interlacing problems with the DVD wouldn’t be replicated on the Blu-ray since it would be 1080p24, and I demurred, by pointing out that it may yet be released in 1080i50. One (or perhaps two) interesting point(s): playback commences with two film company logos (the DVD doesn’t start with any). First, the MGM logo, followed by the American International logo. AI was the mob that released the movie theatrically in the US way back in 1980, first dubbing it with American accents (it is disputed whether this was because it felt Americans couldn’t cope with Australian accents, or whether the original sound mix was so bad that it had to be fixed). MGM was the company that released the DVD version (with the original Australian sound) in the US in 2002, so my guess is that the Blu-ray was taken from a US copy of the print. This entry was posted in Blu-ray, Disc details, Video. Bookmark the permalink. 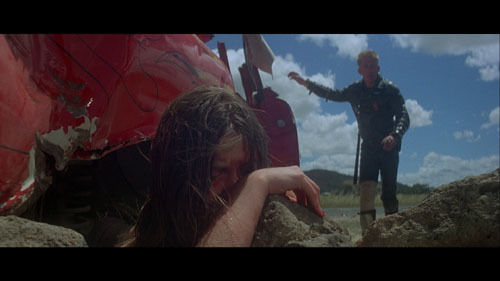 Hi, do you know how the 2 nd Mad max movie fares in terms of video quality on it’s blu- ray version?